The electronic component of TERMOLEGNO drying system allows monitoring the progress of the process, to carry out all necessary checks and to set the process data. It has a powerful microprocessor that allows an efficient conduction of the drying cycle and the storing of all the data and events in a historical archive containing every time indication. It is foreseen a basic division of the drying cycles in 8 stages (in option it is also available in 24 stages), the unit is designed both for drying cycles and for heat treatments for packaging and pallet complying with ISPM-15 FAO REGULATIONS, possibly also in the cycles of drying. 4. start the cycle by pressing START. The system of data collection is provided with sensors for measuring both the moisture of the wood (AWM), both the temperature inside the cell (T) and the equilibrium moisture in the cell (EMC). The adjustment is carried out in a continuous manner and uses two communication lines: one for the acquisition of the measures, of the operating states of sensors and to control the actuators, the other for data exchange with the supervisory computer and programming. 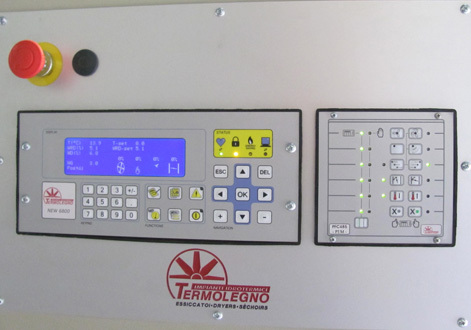 TERMOLEGNO software allows supervision and centralized and/or remote control of drying cells, that can be connected to each other up to a maximum of 32 units. It’s also equipped with integrated technology developed for graphical analysis of historians and the generation of detailed and multi page reports, as well as a database of drying programs already stored in the system with the possibility, however, of being able to develop new ones. The software, also, enables the tele-assistance that Termolegno provides to its customers. The electronic component of TERMOLEGNO dryers is selected according to the type of wood and the type of treatment. According to customer requirements (greater importance to the quality of the finished product, greater importance to drying/treatment speed) it is proposed additional electronic equipments and available reading tools in order to allow the customer a better management of cycles and a consequent energy saving.